Daejeon, Korea, Dec 3, 2016 - (ACN Newswire) - Researchers from Korea's Electronics and Telecommunications Research Institute (ETRI) have developed a high performance processor for autonomous vehicles called Aldebaran. Increased focus by the automotive and IT industries on enhancing autonomous vehicle technology has increased the market for dedicated core processors customized for autonomous vehicles. Aldebaran is a high performance processor designed using all-Korean technology for autonomous vehicles. It consists of four superscalar processors and an object recognition vision engine integrated to meet all functional safety requirements as specified by ISO 26262. Electronics components are indispensable to new cars as they play vital roles in critical functions. The proliferation of electronic components integrated into cars have spotlighted reliability issues regarding electrical circuits, as malfunctions can directly affect the safety of passengers. Moreover, several factors natural to typical vehicle operating conditions - including temperature, radiation, etc. - can potentially cause malfunction in electronic devices posing great risk. Processor IC chips are central computing components that can collect information from peripheral input components (e.g. radar, lidar, ultrasound, etc.) and process the information to control the system. Needless to say, the processor is an integral component of the autonomous vehicle and its malfunction could result in catastrophic results to passengers. ISO26262 is an international standard concerning the functional safety of electrical/electronic systems in production automobiles that was developed by the International Organization of Standardization (ISO). ISO26262 defines functional safety for electronic parts including electronic system hardware, software and production. Furthermore, the second edition of the standard includes material regarding the development and production phase of semi-conductor devices. ETRI's Aldebaran is Korea's first 1GHz processor targeting automotive applications compliant to the functional safety requirements of ISO26262 Part 11 and Part 5. The Aldebaran processor monitors the activities of multiple cores in real time to provide fault tolerance. Four cores are capable of operating independently at 1 GHz to provide high computational capacity. The Aldebaran processor includes a proprietary superscalar architecture, 32KB / 32KB cache memory, and a memory management unit (MMU) for virtual memory operation, with an emphasis on implementing an ultra-low power processor core. Aldebaran's I/O interface comes highly equipped for automotive applications with CAN (Controller Area Network) and CAN-FD (Flexible Data rate), serial communication via UART, and I2C. Furthermore, Aldebaran includes vision accelerators for vehicle and pedestrian detection. While similar autonomous vehicle processors in the market today consume hundreds of watts of power, Aldebaran is an ultra-low-power processor that consumes 100 times less power. One core in the Aldebaran processor consumes 0.24 watts at 1GHz and less than 1.0 watt when all four are operational. As the number of automotive electronic components increase, high power consumption is a decisive factor for decreasing the reliability of automobiles, and the importance of Aldebaran's low power processor is expected to gain more attention. We have verified the functionality of the chip with general operating systems such as Linux and RTOS, and created a developer friendly software development kit (SDK) that includes a C / C ++ compiler. The Aldebaran processor was manufactured 28nm CMOS process technology, and exhibited a 1.0 GHz operating frequency and 4.0 GOPS performance in actual operation verification while demonstrating the highest power efficiency in the industry at 0.24 mW/MHz. In collaboration with autonomous vehicle manufacturers, the Aldebaran processor was installed on an actual vehicle for steering control via image recognition, lane detection, lane recognition result analysis, and CAN. The Lane Keeping Assistance System (LKAS) demonstrated successful compliance to ASIL D level functional safety as defined in ISO 26262 Part 11 and Part 5. 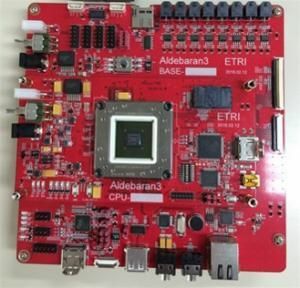 This development was facilitated by the Korean Ministry of Industry and Commerce, and ETRI has expanded its application area by successfully completing technology transfers of the Aldebaran processor and software development environment. In the upcoming era of autonomous navigation, companies with high performance processors and software with light-weight, functional safety technology will play pivotal roles in the field. While many enterprises spend billions of dollars every year to import processor core technology, the Aldebaran processor, which was developed using entirely domestic technology, will undoubtedly play a pivotal role in the development of the intelligent semiconductor industry.